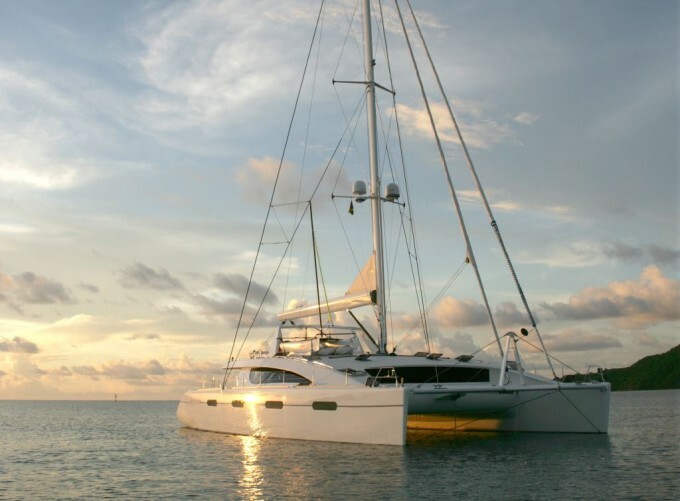 British Virgin Islands Yacht Charter in the Caribbean Aboard Charter Catamaran AKASHA – Superyachts News, Luxury Yachts, Charter & Yachts for Sale. Her name speaks for itself! AKASHA in the ancient language of Sanskrit means ‘infinite space’ and this what she is truly about. She is a 76ft (23m) Matrix catamaran, launched in 2005, hosting futuristic design and vast spaces aboard. Her flybridge has cushioned seating, a nice sunbathing area and a refrigerated bar. From here guests will also enjoy the fantastic 360° panoramic views, perhaps while listening to their favourite music throughout the Bose wave entertainment system. AKASHA yacht is also fully air-conditioned and comes with a Playstation 2 and satellite TV. Lovely accommodation for 10 charter guests is divided into five cabins, one of which is the spacious master suite with a king-sized bed, a lounge and a spa pool. The additional four guest rooms are all with queen-sized beds, one of which can be converted into a twin cabin; all of them have their own en-suite bathrooms. You British Virgin Islands yacht vacation in the Caribbean aboard AKASHA catamaran includes the highly professional crew, all meals and snacks, standard beverages and the use of all water-sports toys on board. The latter includes water skis, wakeboard, kneeboard, sunfish, sailing dinghies, scuba diving equipment, double tube, kayaks, fishing gear, snorkel gear or floating mats. For complete relaxation and rejuvenation one of the stewardess aboard is a qualified masseuse offering full body swedish massage, and there is also a scuba diving instructor. AKASHA’s Captain Oswaldo and talented Chef/Mate Briar, stewardess Emma and deckhand Mitch look forward to welcoming you aboard this exceptional 76ft Matrix catamaran. This highly professional team of four is very friendly, attentive as well as entertaining, with their diverse cultural backgrounds and rich life experience. The BVIs represent a breathtaking cluster of over fifty volcanic islands and cays located to the east of Puerto Rico. Around fifteen of these spectacular islands are inhabited. With the majority of the smaller islands spread only a few miles from each other, the British Virgin Islands yacht vacation offers countless bays to explore, swim and dive around or simply enjoy the spectacular scenery. The largest island is Tortola, which is also home to the capital, Road Town. The southern side of Tortola is prevalently cliff face, whereas the North side boasts unspoilt white sand beaches. In addition to the first-class cuisine prepared to perfection by Chef Briar in the comfort of your BVI charter yacht AKASHA, the islands also offer a nice selection of lovely restaurants offering delectable menus made of fresh local produce. Norman Island or Treasure Island is one of the destination which is often included in a British Virgin Islands yacht rental itinerary and represents a perfect place for snorkelling at the caves, where you will be amazed by the sheer amount of fish swimming in the crystal clear waters. For those in love with hiking, you can walk to the top of the Spy Glass Hill, a renowned lookout point for the pirates. Another great place to dive and snorkel is the Salt Island. Here you will find The Wreck of The Rhone, which is one of the most famous dive sites in the world. The R.M.S. Rhone (Royal Mail Steamer) went down in 1867 in a hurricane storm and represents one of the first iron ships constructed, featuring elegant lines of a sailing ship. Peter Island, renowned for its romantic beaches, is the next stop with secluded bays – White Bay and Spring Bay – located on the southern side of the island. This area is excellent for water sports and sunbathing. On the other side, we have the Little Harbour and Great Harbour, both offering pristine anchorages and fabulous place to relax. Situated in a stunning and sheltered emerald-green lagoon, Marina Cay is an island like no other. It is covered in flowers and surrounded by soft, white-sand beaches. The third largest island in the BVI is Virgin Gorda with a unique geologic formation known as ‘The Baths’ situated on the southern end of the island. Here the beach shows evidence of volcanic origins, with massive granite boulders lying in piles on the beach. While on a Virgin Gorda yacht charter you could also visit the Yacht Harbour located in the charming little town called the ‘Spanish Town’, with a few restaurants, small shops and a bank. Anegada is a home to the third largest barrier reef in the world and a ‘must see’ on any British Virgin Islands yacht charter in the Caribbean. It boasts deserted beaches, fringed reefs and distinctive flora and fauna, including the pink flamingo. Any Anegada yacht charter should include a visit to the Cow Wreck Beach and the Loblolly Bay. Snorkelling here you might see turtles and other fascinating sea creature hiding behind the reef. Jost Van Dyke is renowned for its casual lifestyle, lovely beaches and fantastic beachfront restaurants and bars. Places to visit are the White Bay, the Great Harbor, the Diamond Cay and Sandy Spit.